It's time again for the Action Kivu Fundraiser. It's hard to believe that it's been eight years since I've been involved with this project. It's a cause that is close to my heart first because it harnesses the power of sewing to change the lives of women and children and because it is a small organization that does targeted work to make a positive difference in the world. 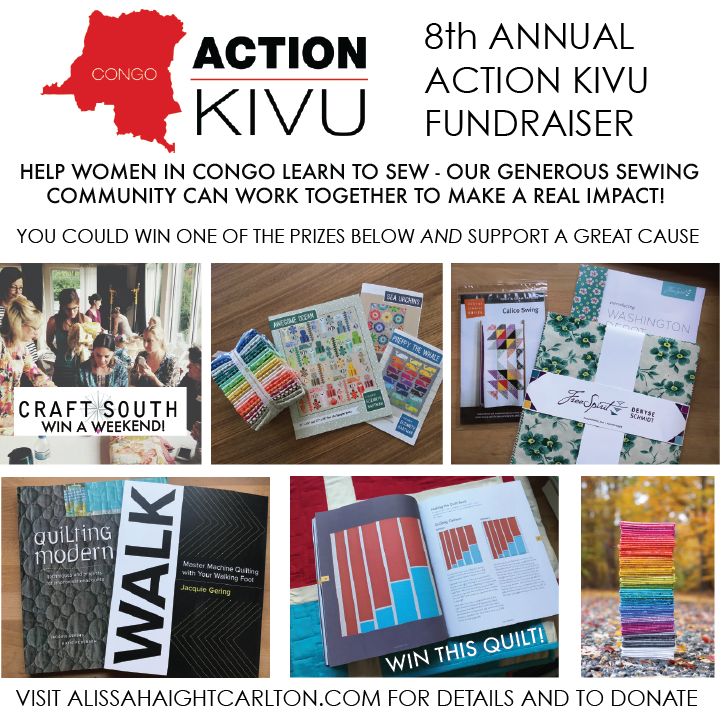 This year the fundraiser will raise funds to purchase graduation sewing machine kits for 42 women who are victims of the conflict in the Congo. These kits will allow them to use the skills they have acquired through their participation in the program to support themselves and their families. As part of the sewing community I ask each of you to give what you can to this cause. Dig deep if you can. There are wonderful prizes that have been donated by myself and my colleagues. I've waited until today to post hoping to see the thermometer rise more during the week. It's not where we need it to be, so let's make this last push to get to the goal and fund this program. The fundraiser ends Sunday so we have two days left to make it happen! If you want to read more about the organization and its work check out the Action Kivu site. Thank you in advance for your generosity and support of these women and their families. Thank you for donating your books to this cause, Jacquie! I've been wanting a copy of Walk, so I donated for a chance to win it.